Four times the Government Digital Service (GDS) have published a post with the same title, The next 6 months: services that plan to start using GOV.UK Verify (RIP), on 29 October 2014, 5 January 2015, 20 February 2015 and 14 May 2015. Why are there no 2015 plans to add GOV.UK Verify (RIP) identity assurance to GDS's electoral registration application? Why aren't GDS working with the Foreign Office? Or the Home Office? Or the Ministry of Defence? Or the Department of Health or the Department for Education? Five digital services in four central government departments are due to have GOV.UK Verify (RIP) standing guard at the gate in 2015. It's really only four services because Change of address (service d in the table below) disappeared after the January progress report. Four digital services for four departments but 12 for HMRC alone, Her Majesty's Revenue and Customs, whose job it is to raise about £650 billion a year from us taxpayers. GOV.UK Verify (RIP) looks like spending its last few months alive working on HMRC applications, it is to all intents and purposes an HMRC project. HMRC currently use the Government Gateway for access control. They have done for 15 years. They don't need a new system that doesn't work. They need to spend some money on the Government Gateway, which has been starved of resources for many years now, in an incomprehensible act of vandalism. The Insolvency Service is "an executive agency, sponsored by the Department for Business, Innovation & Skills". Please see service a in the table below. On 29 October 2014 GDS promised that 15,000 users would be connected to the Insolvency Service's Redundancy payments digital service by GOV.UK Verify (RIP) "in first 6 months (ie by April 2015)". Did they achieve that two months ago? No. By the time of the 14 May 2015 progress report, GDS were promising 15,000 GOV.UK Verify (RIP) service-users by November 2015. Tantalus was the unfortunate chap in Greek mythology who stood in a pool of water but could never get anything to drink and by a fruit tree but he could never get anything to eat. BIS have been tantalised for seven months now by 15,000 users who always seem close but never get any closer. Take a look at the Redundancy payments service on GDS's performance dashboard and under Digital take-up it says "no data". Take a look at the Insolvency Service's website and they offer you a telephone number (0330 331 0020) or an email address (redundancyclaims@insolvency.gsi.gov.uk) but no on-line application form for redundancy payments. Click on Your rights if your employer is insolvent and then Claiming money owed to you, and you get taken to a page that tells you to ring the redundancy payments enquiry line and ask for a form RP1 to be sent to you. And yet GDS's 14 May 2015 progress report says that the digital service is "in public beta". ... at which point, sorry too, he stopped investigating although several more codes then queued up like London buses on his phone. ... one down from "Live". Dead? DEFRA is the Department for Environment Food and Rural Affairs, their Rural payments service is no.8 on GDS's transformation list, it's reached the "Public Beta" stage according to the 14 May 2015 progress report and, as with Redundancy payments, GOV.UK Verify (RIP) teases and tantalises with promises of users who are always close by in the wings but never appear on stage – Rural payments was promised 100,000 of them for April 2015 and they're still promised now, but not until November 2015, please see service b in the table below. Empty promises of jam in the future are only half the story of Rural payments, though, where GOV.UK Verify (RIP) is the necrophiliac gatekeeper to a digital service that is stone cold dead. "A multi-million pound government IT system to process EU subsidy payments for farmers in England has been largely abandoned after 'performance problems' ... The system will be re-launched next week with farmers asked to submit Basic Payment Scheme claims on paper forms", the BBC told us in March, "... farmers say they have struggled with the £154m website for months". This fact is not mentioned in the 14 May 2015 progress report, where GDS tell us that GOV.UK Verify (RIP) has been "connected" since July 2014. Connected to what? A corpse? As farmers keep pointing out, for £154 million DEFRA officials could take a taxi to visit each one of them to fill in the application form and there'd still be change. The executive director of GDS assured us on 11 January 2013 that he was working on the Rural payments service himself , that development of the system "embraced agile completely", that it was "going to be another example of government as a platform" and that it was "going to help us deal with Europe in a different way". Not so different in the event. Rural payments come under the European Union's Common Agricultural Policy (CAP) and the National Audit Office told us in July 2014 that "... the total value of disallowance penalties accrued or provided for since the introduction of the CAP 2005 in 2008‐09, is currently £580 million". Never mind GDS's executive director's personal involvement in agile government as a platform, the scene is set for a repeat. The same way of dealing with Europe as before. Another £580 million fine. GDS are inordinately proud of their Digital Service Standard and the attention they pay to user needs and the thoroughness of their Digital by Default Service Standard Assessments. How is it then that Rural payments was ever allowed into Beta testing? And how is it that the users were blamed for Rural payments being unusable? Despite being in Public Beta there is no performance dashboard for Rural payments. The Driver & Vehicle Licensing Agency is "an executive agency, sponsored by the Department for Transport". The View your driving licence information service, service c in the table below, has been available for a long time now. Tantalisingly, on 29 October 2014 GDS told us that we would be able to use the service through GOV.UK Verify (RIP) from December 2014. On 5 January 2015 it was going to be connected that month and usable by March 2015, which it wasn't and it still isn't. On 20 February 2015 the service was due to be connected by March 2015 and on 14 May 2015 it was due to be connected by July 2015. Unlike Rural payments, View your driving licence information actually exists. It's seven months since the first progress report, last October. And GOV.UK Verify (RIP) still isn't even connected. What's the problem? How difficult can it be to add this extra identity assurance to an existing service operated by a particularly co-operative agency, DVLA? 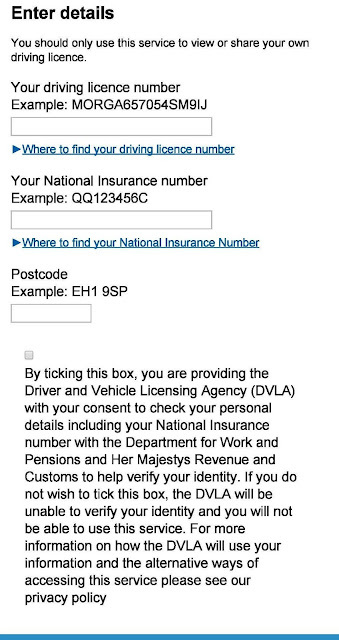 If GDS can't add GOV.UK Verify (RIP) to View your driving licence information what can they add it to? How can any other agency have confidence in GOV.UK Verify (RIP)? Why should central government departments want their users to "connect" through it? Or local government – would it be prudent for them to irritate their Council Taxpayers with repeatedly undelivered promises? Whatever the answer – and needless to say GDS's progress reports don't tell us – we drivers still can't connect to the service using GOV.UK Verify (RIP). Instead, we continue to use driving licence number, National Insurance number and post code. And DVLA themselves say of that combination of information that it "does not provide us with the level of confidence the user is who they say they are". GDS promise that GOV.UK Verify (RIP) will deliver the requisite level of assurance. But when? "Due to connect by July 2015"? We've heard that before. A prototype for IDA will be completed by the end of the year . The first services will be developed and tested by February 2012, with IDA due to be rolled out for initial public services by autumn 2012. Computer Weekly magazine told us that. The initial DWP services will be required to provide identity assurance for approximately 21 000 000 claimants. As the HMG customer base is diverse, a wide range of suppliers will be required to ensure demographic coverage to ensure that no claimant sector is unfairly disadvantaged by limiting supplier choice. To support the rollout of universal credit and personal independence payments, identity assurance suppliers will be selected in summer 2012 and systems will need to be fully operational from spring 2013. 21 million claimants. £30 million. Really? Selected in the summer of 2012. Fully operational from the spring of 2013. Really? On 29 October 2014, GDS said that IDA (identity assurance) – which by then had become GOV.UK Verify (RIP) – would "connect" the first Universal Credit users (service e in the table below) by April 2015. Few people can have been surprised when that didn't happen. Not even Tantalus. ... is now the senior responsible owner for IDA. “It’s something that I put my hand up for because it’s so important. Unless we have better and wider used security protocols, it will be hard to identify users, allow transactions and link up services. Her Majesty's Revenue and Customs "are the UK’s tax and customs authority, responsible for making sure that the money is available to fund the UK’s public services and for helping families and individuals with targeted financial support. Through our customs service we facilitate legitimate trade and protect our economic, social and physical security". They've got a few transactions and a few services to link up. There are have something over 30 digital services to link up and, according to GDS's Transactions Explorer, HMRC undertake 1.1 billion transactions a year. It is, indeed, "important", as Mr Bracken says, that HMRC should be able to identify their users. HMRC are expected to collect around £667 billion in 2015-16 according to the UK's 2015 Budget (page.6). No HMRC, no public services. Luckily, they already can identify their users via the Government Gateway, which is where we came in. Because at the present rate, it's going to be a tantalisingly long wait before HMRC can identify them through GOV.UK Verify (RIP). The remaining 4 are in private beta with small numbers of invited users. Thin gruel. Very thin in the case of the late Rural payments. There is no mention of the problems people are having registering with GDS's "identity providers" – Experian, Digidentity, the Post Office and Verizon. There is no mention of Experian's unfortunate experience in the US, where they found themselves providing personal data to a fraudster and no mention of Verizon's stated mission to use personal data to promote the sales of their clients. Nor of Verizon having its German government contract rescinded. Digidentity is Dutch and Verizon are American. They have no database of people in the UK. They can only conduct registrations by checking with other organisations. Digidentity use Callcredit, the credit referencing agency. Who knows who Verizon use? Why insert Digidentity and Verizon into GOV.UK Verify (RIP)? Instead of middlemen, why not appoint Callcredit and whoever Verizon use as "identity providers"? Another matter not mentioned – who gave Callcredit permission to pass information about you to Digidentity? GDS acknowledge that it's impossible to identify everyone by their credit record (Experian and Callcredit). They need a wider selection of personal information about us all to identify us. They don't seem to have made any progress there, but that's not mentioned. 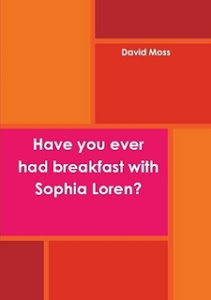 There is no mention of the security questions which arise. What defences does the GOV.UK Verify (RIP) hub have against hacking? It's a daily event. Here's today's – US officials report massive data breach at federal human resources agency. Are GDS interested in security? They say explicitly that they're more interested in usability. The fifth lack of progress report on GOV.UK Verify (RIP) has just been published, Services that plan to start using GOV.UK Verify. It's 23 July 2015, eight days away from August. On 20 February 2015 GDS told us to expect 20,000 GOV.UK Verify (RIP) users of HMRC's check/update your company car tax on-line service. Did you believe that? Will we see those 20,000 users in eight days time? No. We are now told that it will be November 2015 before we see them. Do you believe that? If so, why? After all, back on 29 October 2014 GDS told us to expect these 20,000 users by April 2015. April didn't happen, so to speak, August isn't going to happen so why should November happen? The Government’s aim is that all the services that need identity assurance for individuals will be using GOV.UK Verify [RIP] by March 2016. Even if you believed that then, you can't now, can you? The sixth lack of progress report on GOV.UK Verify (RIP) was published yesterday, Government services using GOV.UK Verify - November 2015 update. The bellwether of GOV.UK Verify (RIP) is, of course, HMRC's check/update your company car tax on-line service. We were expecting 20,000 users by April 2015. Then by August 2015. And then by November 2015. 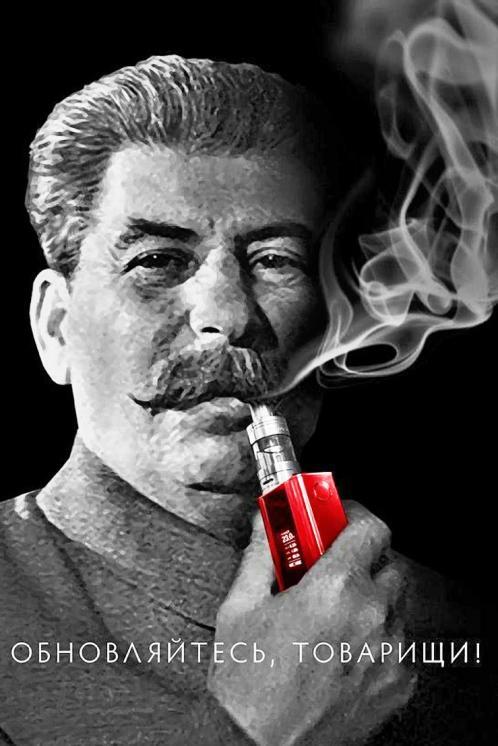 It is November 2015 now and do we have 20,000 users? No. The bad news is that we will have to wait until April 2016, a full year after the first deadline. On the other hand, the good news is that there will be 25,000-30,000 users. For sure. Some time between January and March 2016 12,000 of us will be able to declare ourselves bankrupt on-line. And at some date yet to be confirmed 120,000 of us will be able to file for uncontested divorce on-line. Then we get brought back down to earth. The HMRC digital service that no-one seems to be able to use to transfer marriage allowance between spouses was "Connected Jun 2015 in private beta" and then "trial ended in July 2015". I.e. it doesn't work, no-one can register themselves with GOV.UK Verify (RIP). So how does that GOV.UK Verify (RIP) connection qualify to be included in the table of "services already using GOV.UK Verify"? Ditto DEFRA's claim rural payments service which appears in the same table. There is no such digital service. It's odd but there is no mention in the November 2015 "update" of the fact that the identity verification tests are being diluted: "Whereas previously you would often need 3 pieces of evidence to prove your identity, now you will often only need 2 pieces of evidence". And no mention of the introduction of magic into the verification process: "You can take a photo of yourself instead of answering questions based on credit history". The level of assurance (LoA) offered by GOV.UK Verify (RIP) is meant to be 2 (civil courts) or even 3 (criminal courts). With this dilution and biometric magic, the connected digital services will be lucky to exceed an LoA of 1 (self-certification). And there is no mention of GDS's exciting introduction of so-called "basic" GOV.UK Verify (RIP) accounts, unverified self-certification that you are you, on which no relying party like HMRC or DEFRA can sensibly ... rely. The next lack of progress update is expected in February or March 2016, just before GDS triumphantly declare GOV.UK Verify (RIP) to have gone live. RIP. Over the years, the date on which the Government Digital Service (GDS) promised to introduce a live, government-backed identity assurance scheme into the UK has changed from autumn 2012 to April 2016. Yesterday, 29 April 2016, GDS announced that there would be a delay, GOV.UK Verify: April update on progress towards live. "We’re very nearly there", they said, but not quite. Reporting an interview with Janet Hughes, GDS's programme director of GOV.UK Verify (RIP), Computer Weekly magazine told us on 26 April 2016 that: "With the official 'live' date for the programme set for 29 April 2016, Hughes is confident everything is on track". What changed in three days? In what way was Janet's confidence misplaced? "We haven’t yet finished the Service Standard assessment process", Janet told us yesterday. She must have known that when she spoke to Computer Weekly. When will it be finished? She doesn't tell us. Presumably it's not a foregone conclusion that GOV.UK Verify (RIP) will pass, when it is at last assessed. Or has it already been assessed and failed? She doesn't tell us. "Live will not be a dramatic change. It’s part of an ongoing gradual process of developing and scaling up the service and GOV.UK Verify will actually look exactly the same to users". If going live is so insignificant, then why not declare GOV.UK Verify (RIP) to be live yesterday? ... but in that case, why bother? Answer from Janet, "over 50 government services are planning to adopt GOV.UK Verify [RIP]. Twenty of these are planning to connect to GOV.UK Verify [RIP] in the next year". We've been told this ever since the 29 October 2014 lack-of-progress report above. Adoption remains forever on the horizon. In view of the circumstances, it undermines GDS's case somewhat to make the eight companies claim. 185,000 of those occasions on which GOV.UK Verify (RIP) has been used were to create unverified, "basic" accounts. 502,000 "uses" were to create verified accounts and that's not really "using" GOV.UK Verify (RIP), is it, just as acquiring a screw driver isn't the same as actually putting up a bookshelf. That leaves us with 591,000 "sign-ins". Maybe that was 591,000 useful outings for GOV.UK Verify (RIP). Or maybe 502,000 of them were just people checking that the account they had just created works, leaving just 89,000 people viewing their driving licence details. Who knows? 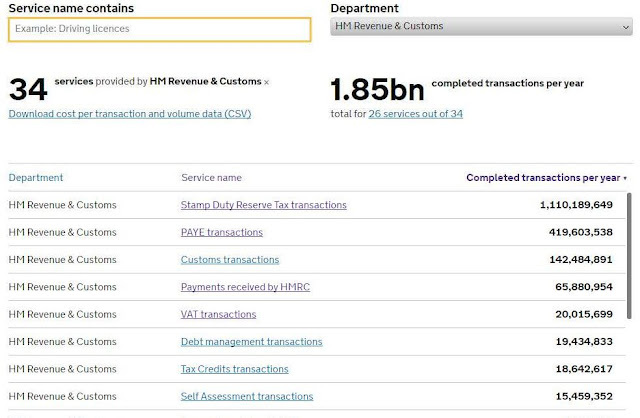 A lot of those 1,850,000,000 HMRC transactions depend on people and companies being connected to HMRC via the Government Gateway. Don't forget that GOV.UK Verify (RIP) can't handle companies. Only individuals. HMRC need the Government Gateway to remain open whether or not GOV.UK Verify (RIP) is declared to be live. When you create a Government Gateway account, you hand over a bit of personal information to the government. If you create a GOV.UK Verify (RIP) account via Verizon, say, you hand over a lot of personal information to a company within the Verizon Group or other affiliated entity, Equifax, ID Checker, Zentry LLC, Techmahindra Ltd and Expert Solutions Support Centre. Who wants to do that? Why? Janet almost never mentions the Government Gateway. But it's there, and it has been for 15 years, and it works. It undermines GDS's case somewhat, again, not to mention the Government Gateway and not to give it its own dashboard on GDS's flaky performance platform, unlike GOV.UK Verify (RIP) which does have its own dashboard. People will want to know why we need GOV.UK Verify (RIP) given that we already have the Government Gateway. Why spend money on failing to deploy the former when it could be better spent on improving the latter? As things stand, the senior decision-making team that declares GOV.UK Verify (RIP) to be live runs the risk of destroying its own credibility in the process. First the US National Institute for Standards and Technology asserted that GOV.UK Verify (RIP) cannot do identity-proofing, i.e. it offers no more than self-certification. Then Rt Hon Matt Hancock MP, Minister for the Cabinet Office, declared GOV.UK Verify (RIP) to be live. ... and we learnt that the payments industry are now working on their own on-line identity authentication standard, PAS 499, GOV.UK Verify (RIP) not being up to snuff eIDAS-wise, GDPR and PSD2. And then the seventh lack of progress report on GOV.UK Verify (RIP) was published, Government services using GOV.UK Verify - May 2016 update. In the first lack of progress report back in October 2014 we were told that "the Government’s aim is that all the services that need identity assurance for individuals will be using GOV.UK Verify [RIP] by March 2016". Needless to say, that didn't happen. Subsequent lack of progress reports have kept the forecast figures more or less unchanged but moved the target date/goalposts six months back. In this latest report, the target date is the best part of a year away, April 2017. For example, following the November 2015 lack of progress report, we were hoping for between 25,000 and 30,000 GOV.UK Verify (RIP) users of HMRC's Check or update your company car tax service by April 2016. Now we have to hold our breath until April 2017 to see if we have between 100,000 and 200,000 users. Has there been any progress or hasn't there? We don't know. GDS's report doesn't tell us. How about the GDS performance platform dashboard for Check or update your company car tax? No data has been added since December 2015. And the old data that is available doesn't tell us how many GOV.UK Verify (RIP) users there are. So much for the government services GDS have been reporting on until now. And the new services that we have been promised will be connected by GOV.UK Verify (RIP)? We were led to believe that there were up to 50 public services to be added to the portfolio as soon as GOV.UK Verify (RIP) was declared live. In the event, just 18 are listed. 18 is not 50. And of those 18, 10 have forecast details yet to be confirmed. Either GDS know the missing dates and user numbers and don't want to tell us. Or they don't know them and the announcement that these 10 TBC services are in the GOV.UK Verify (RIP) pipeline is premature and unconvincing. Two news organisations have now announced that HMRC are working on a successor to the Government Gateway. GOV.UK Verify. RIP. There has been no update to Government services using GOV.UK Verify - May 2016 update. Why's that? Rigor mortis? Any news about what's happening with DWPs Bereavement Allowance? It was due to be verify compatible last year but there hasn't been an update. Thanks for your query. DWP’s Bereavement Service was due to connect to Verify in 2017. However, this is a large scale project, and the service has recently prioritised improvements to other parts of the service which means adoption of Verify is likely to take place in a subsequent phase of the project. Claimants should continue to use the existing service until there are further updates from DWP. "The service has recently prioritised improvements to other parts of the service", the Government Digital Service (GDS) tell us. Which other parts? They don't say. "Adoption of Verify is likely to take place in a subsequent phase of the project". When's that? They don't say. "This is a large scale project". How large? Too large for GOV.UK Verify (RIP)? Too large for GDS? That could be it. In other news – Angling to meet user needs at Defra – we read that: "The Department for Environment, Food and Rural Affairs' (Defra) new online fishing rod licence service recently moved from private to public beta ... Head of Digital at Defra, Sally Meecham, explains why the service is so simple, a child can use it". The Government Digital Service (GDS) started their series of progress reports, The next 6 months: services that plan to start using GOV.UK Verify (RIP), on 29 October 2014. At no point did they mention that GOV.UK Verify (RIP) would be used for local government services. Nevertheless, that is the plan and DMossEsq has been keeping readers abreast of progress, including the fact that more than half of the local authorities who started have now pulled out of GOV.UK Verify (RIP) trials. PublicTechnology.net (PT) have covered the same story, please see Local government Verify pilot hit by council departures. Their article includes explanatory comments from all participants in the trials except GDS themselves. PT say: "The Cabinet Office and GDS were approached for comment on the trials, but a spokesperson said they would not provide a running commentary on the pilot during the pre-election period". It seems a pity that GDS can't comment. Think back. In October 2014, GDS told us that people would be able to connect to HMRC's on-line Renew tax credits service using GOV.UK Verify (RIP) by March 2015. GDS said further that there would be 1,000,000 (max) users of this service connected by GOV.UK Verify (RIP) during 2015. You have to log in using the Government Gateway, not GOV.UK Verify (RIP). GOV.UK Verify (RIP) didn't connect the public to Renew tax credits in March 2015 and it still doesn't. Far from 1,000,000 users connected by GOV.UK Verify (RIP) in 2015, there were and there still are none. Renew tax credits remains stubbornly missing from GDS's list of on-line government services using GOV.UK Verify (RIP). Whether GDS are commenting or not, the story remains the same. GOV.UK Verify? RIP. 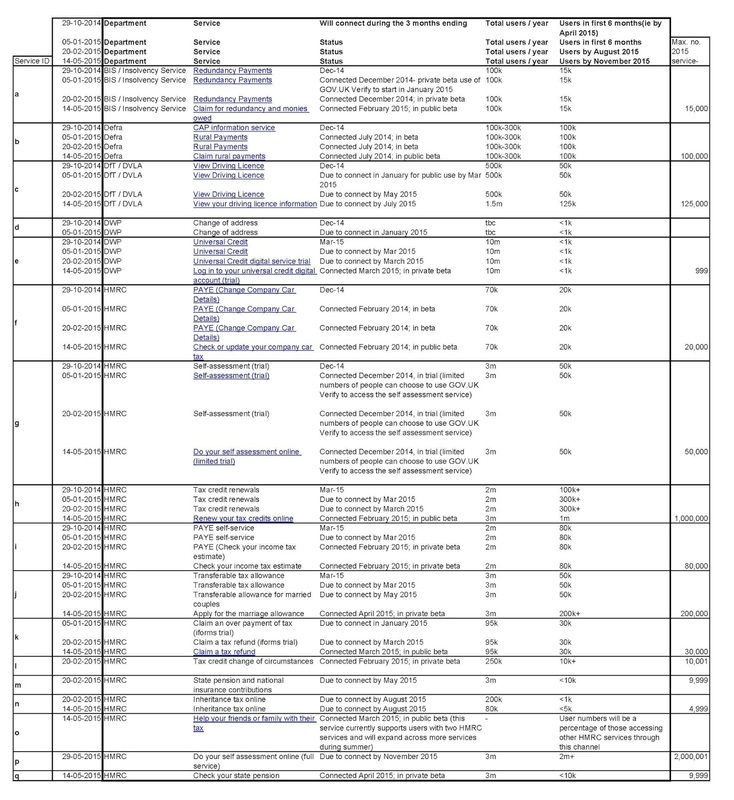 The Government Digital Service (GDS) have made seven predictions about the number of services that would be connected to their lifeless identity assurance service, GOV.UK Verify (RIP), on 29 October 2014, 5 January 2015, 20 February 2015, 14 May 2015, 23 July 2015, 2 November 2015 and 25 May 2016. Francis Maude was replaced first by Matt Hancock, then Ben Gummer and now Damian Green, supported by Caroline Nokes. Matt Hancock has moved to the Department for Culture Media and Sport which has taken over some of GDS's responsibilities and become the Department for Digital Culture Media and Sport. Responsibility for the Government Gateway has been taken away from the Department for Work and Pensions and given to Her Majesty's Revenue and Customs, who are working on a successor as GOV.UK Verify (RIP) is no use to them. Only three local authorities are left out of 15 starters who were trying to use GOV.UK Verify (RIP) for residents' parking permits and only two out of the original 11 local authorities are left in the attempt to use it for concessionary travel. 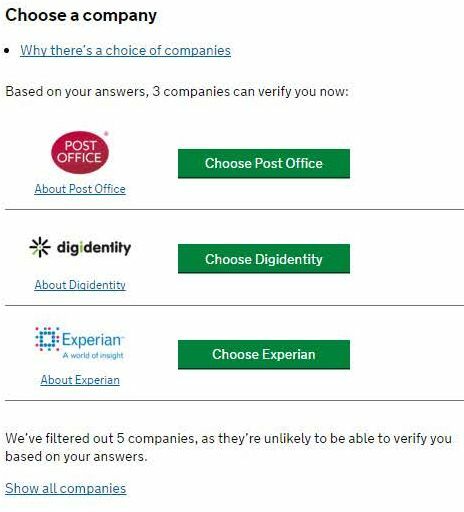 The Open Identity Exchange have demonstrated several times that GOV.UK Verify (RIP) has nothing to offer either the financial sector or the major retailers. Mike Bracken was replaced as head of GDS first by Stephen Foreshew-Cain, then by Kevin Cunnington. Janet Hughes, programme director of GOV.UK Verify (RIP), left. There hasn't been a single addition to GDS's identity assurance blog since 30 March 2017, all but eight months ago. ... and yet GDS continue to predict that there will be 25 million users of GOV.UK Verify (RIP) by 2020. How can they achieve that? Where are the users going to come from? On 14 November 2017 PublicTechnology.net (PT) published Virtual mortgages and online divorces – the future of government digital services: "Within the next three years the government plans to create 89 new digital services – including online divorces and mortgages". On 23 July 2015 GDS told us that an on-line uncontested divorce service would be tested from July 2016 onwards and that a test of electronic signatures for mortgages would start between January and March 2016. They stuck to the mortgage dates in their 2 November 2015 progress report but the start date for on-line divorce had disappeared. There was still no date for divorces in GDS's 25 May 2016 report and the date for mortgages had slipped from March 2016 to September 2016, the traditional six-month ever-receding horizon. GDS now want up to three years, which would take us to November 2020, well over four years later than first promised/predicted. The PT article includes this: "Nokes pointed to GDS's Government as a Platform programme an important example of a digital project that has made services 'easier to create, and cheaper to run'. A total of 26 government departments or agencies are currently using Government as a Platform tools to cumulatively deliver more than 100 services ...". There's a bit of sleight of hand there. There are 111 on-line services using GDS's GOV.UK Notify system. That's part of Government as a Platform. It's an email service. And/or text. Some central government departments and some local authorities are using it but HMRC, for example, continue to use their own email system. It's 20 years at least since anyone could claim a noteworthy success by getting an organisation to use email. When it comes to GOV.UK Verify (RIP), another component of Government as a Platform, there are just 14 services using it. GDS claimed 13 services were already using GOV.UK Verify (RIP) in their 25 May 2016 report. In 18 months they've added just one? Just one out of the 18 services listed in that same report under the heading The next 3 months and beyond? They've failed with 17 of them? GOV.UK Verify is dead. RIP. GDS embarrass themselves by pretending otherwise.